What time of year do the cacti blossom? How grand is the Grand Canyon? Does the breeze in Tombstone still smell like gun smoke? These are a few of the things you can discover exploring Arizona this summer. So, after you make sure the AC is functioning, grab license plate bingo (or iPads) for the kids, pack some comfy warm-weather clothing, and venture into the desert. It’s time to see all the unique gifts this great state has to offer. Wyatt Earp’s old stomping grounds might be just the place to begin your trek across Arizona. Located in the southeastern corner of the state, Tombstone is of a different era. “The most authentic Western Town left in the United States” brings to life the Old West charm you’re used to seeing only in the movies. Stop for a drink in a saloon or let the kids kick up dust where gun-toting cowboys on horseback once roamed. However you take in this picture from the past, please do not challenge another tourist to a duel over a stolen parking space. It’s okay to let the cowboy spirit get into your blood, but you have to remember this is still real life. The largest city in Arizona and sixth most populous city in the United States, Phoenix offers all the amenities of a contemporary metropolis. You can spend a weekend golfing, attend a professional baseball, basketball or football game (depending on the time of year), or just kick back and relax at any number of vacation resorts. Keep in mind that it’s quite hot in Phoenix during the summer — it is the desert, after all! — so plan your trip around a pool or take shelter in a good restaurant when the heat takes a toll. You can always visit one of the many area FastMed locations if you forget to properly hydrate for the Phoenix heat. There aren’t a lot of places where you can boat by day and gamble in a luxury casino by night. Lake Havasu is one of those spots. With plenty of outdoor activities, you can entertain the whole family on the water, ride bikes on trails, and wear out the kids with some beach volleyball. Days at Lake Havasu are for the family and nights are for you. Put the tired kids to bed when their little bodies can hold no more fun and enjoy an evening at the tables. Located on the California border, Lake Havasu is only two and a half hours south of Las Vegas, Nevada. If you really catch the Blackjack bug just leave your gas money in the room so everyone can get home. Sitting 7,000 feet high, Flagstaff is well above the desert climate and 10 miles from Arizona’s tallest peak. With a laid-back mountain culture, Flagstaff lets you slow down, relax, and take in the mountain views. If you venture into the surrounding wilderness for a hike, watch out for poison ivy and — we’ll keep saying it until everyone remembers — pack lots of water. You haven’t seen a canyon until you’ve seen this canyon. Are we right? One mile deep in places, this national treasure is many millions of years in the making, and you have to see it in person. It’ll take your breath away. 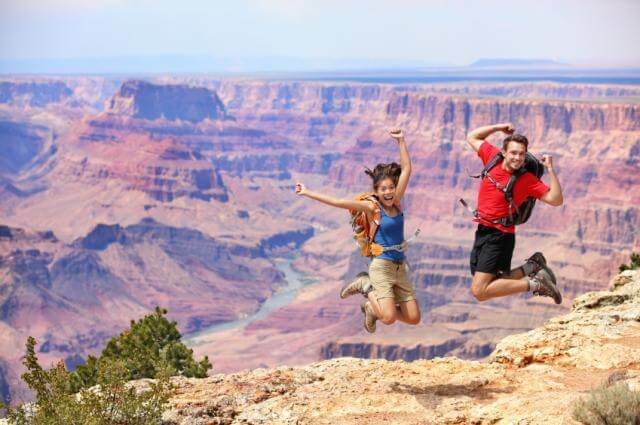 There are a number of ways to experience the Grand Canyon. You can drive right up to the edge or hop on a horse and venture down into the heart of the formation. However you choose to see this wonder, focus on your footing. FastMed can help you recover from most scrapes and injuries, but we don’t have a remedy for the grandest of tumbles. Venture across Arizona and take your time. Stop to enjoy the scenery and observe a cactus or two. The summer is a time to enjoy your family and break away from the everyday routines we all settle into. Wherever you venture this summer, remember FastMed is always available if you need us in case a family member touches a cactus. With locations across Arizona, we can help you get back on the road should any adventure go awry. Want to see how another family is spending the summer? Be sure to keep up with the Pratt Family as they navigate an American Summer.